Is Bernie Sanders Crazy, Blind, or Evil? I live-tweeted last night’s debate between the Governor Mike Pence and Senator Tim Kaine. As the debate closed, I summed up my reaction with two tweets, one of which sadly observed that Donald Trump does not share Ronald Reagan’s belief in smaller government and more freedom. And because I’m fair and balanced, I also reminded people that Hillary Clinton is no Bill Clinton. Indeed, I pointed out that her vote rating in the Senate was almost identical to Bernie Sanders’. That doesn’t mean Bernie and Hillary are identical. I’ve remarked many times that he wants America to become Greece at 90 miles per hour while she seems content for the country to become Greece at 55 miles per hour. But, in practice, they were almost always on the same side when it came time to cast votes on the floor of the Senate. In any case, my tweet obviously touched a nerve since there were a bunch of (mostly incoherent) responses. And I also got this reaction from a law professor at the University of Baltimore. I assume he thinks I was being juvenile to say that Senator Sanders is crazy. Since I actually am juvenile in many ways (particularly my sense of humor), I might be tempted to plead guilty. But let’s actually contemplate how the Vermont Senator should be labeled. Sanders is a virulent and dogmatic supporter of coercive statism. Even columnists for the Washington Post have criticized him for being too far to the left. But he’s not a real socialist (which technically means government ownership of the means of production). And even though his policies are based on coercion, I certainly don’t think he is a totalitarian. Yet he’s not a rational leftist like you find in the Nordic nations (where they at least compensate for large welfare states by being very market-oriented about trade, regulation, etc). All this explains why, when categorizing different types of leftists, I put him in the “crazies” group along with the Syriza Party of Greece. And while “crazies” might be a pejorative bit of shorthand, I do think folks like Bernie Sanders are largely detached from reality. But I don’t want people to be upset with me, so I’m going to reconsider how Sanders should be categorized. To help with this chore, let’s consider a few additional bits of information, starting with an item from his Senate office that contains this remarkable passage. By the way, it’s not clear if this is a column written by Sanders or whether he just endorses the sentiments expressed therein. Though it doesn’t really matter since – at the very least – he obviously agrees with the message. So let’s think about what it means that Sanders views Argentina and Venezuela as role models. Argentina used to be one of the richest nations in the world, ranked in the top 10 at the end of World War II. But then decades of statism, starting with Peron and continuing through Kirchner, wreaked havoc with the nation’s economy and Argentina has plummeted in the rankings. And I’ve written many times about the basket case of Venezuela, so there’s already ample information to discredit anyone who thinks that nation should be emulated. But let’s add one more straw to the camel’s back. Here are some excerpts from a very depressing story about the human misery being caused by big government in that country. Klaireth Díaz is a 1st-grade teacher at Elías Toro School… Last year, she says, attendance was painfully low. Every day, of a class of 30 children at least 10 would be absent. “The reason was always lack of food,” she told Fox News Latino. She said she had a student who skipped class every single Thursday and when she asked his mother about it, she explained that Thursday was the day of the week assigned to her family to buy food at government-regulated prices – which involves standing in line starting sometimes as early as 3 a.m.
Food lines?!? That’s what Bernie Sanders thinks is a success story? Though I guess if everyone has to wait in lines for food, at least they’re all equally poor (though even that’s not true since the ruling-class leftists in Venezuela have plundered the nation’s treasury). In other words, maybe this image isn’t a joke or satire after all. But it gets worse. The food lines apparently don’t provide enough food. Across the country, teachers have said they have seen children faint or fall asleep because they haven’t had enough to eat. …As the school year progressed last year, Diaz said, she noticed more and more kids had stopped bringing lunch. …According to a poll conducted last month by More Consulting among 2,000 respondents in Caracas, in 48 percent of the times children do not attend school, the cause is related to the food. Either they are feeling too weak for lack of nutrition, or their parents rather use the transport money to buy food, or they are in the food lines with their parents. The poll revealed that 36.5 percent of children eat only twice a day and 10.2 percent just once. So maybe Bernie Sanders isn’t crazy. If he views Venezuela as a role model, maybe he’s morally blind. Or genuinely evil. But I’m a nice guy, so I’m sticking with crazy since I would hate to think that even a crank like Sanders willfully embraces the monstrous outcomes found in Venezuela. P.S. 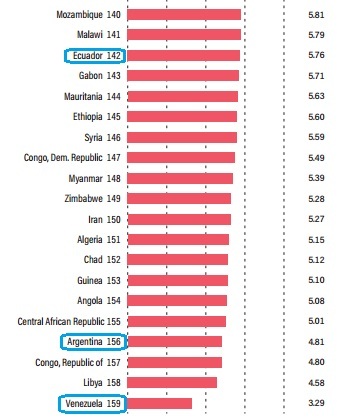 I haven’t written about Ecuador, but if forced to choose among Bernie’s various success stories, I guess that would be my pick since it is 142 out of 159 in the rankings from Economic Freedom of the World, which surely is better than being Argentina (156) or Venezuela (dead last at 159). To be fair to Sanders, at least he didn’t list Cuba, which is such an economic hell-hole that (if reliable numbers were available) it would presumably rank below even Venezuela. and the bern is doing very well………… thank you…..
reality bites… as in Venezuela… what’s amazing is that so many people don’t get it… Jamie Foxx and Lukas Hass are in Caracas to help save that failing leftist regime… these performers are clueless… but they add star power to a despotic government… and promote a flawed ideology… one way or another… over time… this alternate reality will fail… the sad thing is that so many people will lose their dignity… freedom… and in some cases their lives before the socialist myth is finally and totally discredited…. I am a Venezuelan suffering the ills of a socialist narco-state. If Bernie thinks like that, he is an insult for the venezuelan people in consequence I will answer that he is all of the above : crazy, blind and evil. P. T. Barnum said it best… “There’s a sucker born every minute”…………. If capitalism is destroyed, politicians have no competition for power. If you privatize everything, there’s little need for politicians. Bernie is not a socialist, he’s a politician; who, I understand, has three houses. Socialism as government owning the means of production is outmoded and wrong just like the traditional left-right political scale that should run from anarchy on one end to totalitarian dictatorship on the other end. Socialism is actually the secular but religious-like idea that someone knows what is best for the people of for society (fascism — what’s best for the country, communism — what’s best for classes of people everywhere). Socialist thinking people are usually quite willing to use government power to achieve their goals but socialism is not government. In that sense Bernie is indeed a socialist and tries to make it look better by attaching the term “democratic” to socialism to make it look like who knows what’s best is coming from the People. The reason socialism can’t work in complex economics is that no one can know what’s best for others from the top down, and the use of central planning and government controls destroys the benefits of decentralized decision-making, individualized decisions of value, and learning/correcting from experience in the real world.